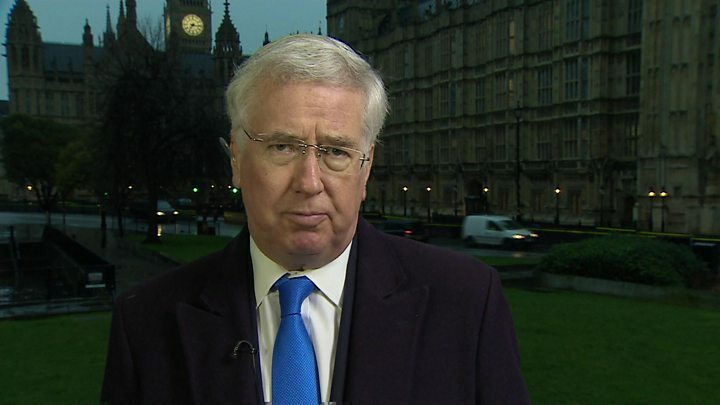 The UK will be taking a "big gamble" with its security if it votes to leave the European Union, defence secretary Michael Fallon has claimed. The "collective weight" of partnerships such as the EU made it easier to deal with global threats, he told the BBC. 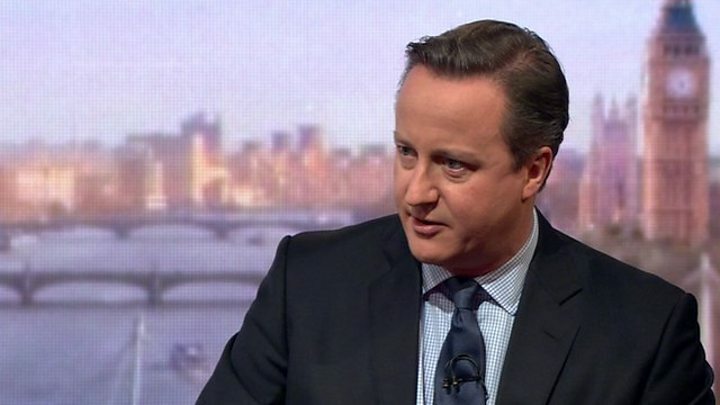 David Cameron will face MPs later as he presents his case for the UK remaining within the 28-member organisation. But Mayor of London Boris Johnson has again insisted that the country has a "great future" outside the EU. Mr Johnson's declaration on Sunday that he backs EU exit is being seen as a significant blow to Mr Cameron's campaign to remain in the EU. The prime minister will outline details to MPs in a Commons statement, starting at 15.30 GMT, of last week's deal with EU leaders on reforms to the terms of the UK's membership, which paved the way for him to call a referendum on EU membership on 23 June. He says the deal strengthens British sovereignty and the UK will be "safer and stronger" remaining in the EU. This message was echoed by Mr Fallon, who told Radio 4's Today that the UK benefited from being part of international partnerships, such as the European Union, Nato and the United Nations. He rejected claims by former Conservative leader Iain Duncan Smith, one of six Cabinet ministers campaigning for the UK to leave the EU, that the UK's membership actually exposed it to greater security risks, pointing out that the EU had taken the lead in confronting Russia over its annexation of Crimea and Iran over its nuclear programme. Media captionBoris Johnson: "I want a better deal for the people of this country"
"At the moment our defence and security rests on Nato, not on the EU, but the EU adds to that security...The EU can do things that Nato cannot." "It is through the EU that you exchange criminal records and passenger records and work together on counter-terrorism...We need the collective weight of the EU when you are dealing with Russian aggression or terrorism. You need to be part of these big partnerships." While he was not saying the UK could not survive outside the EU, he said it would be up to the British people to decide whether "we are safer and stronger inside the EU or take what is a big gamble and leave to what is a rather uncertain future". Asked about Mr Johnson's decision, Mr Fallon said the PM would have preferred "more support" from the Mayor of London but that his was one "individual view" and the overwhelming majority of the Cabinet back Mr Cameron's position. 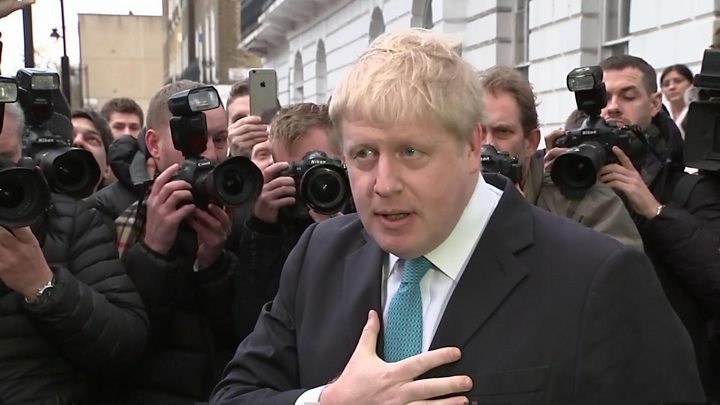 Leaving his home in north London, Mr Johnson said his immediate focus was his remaining time in City Hall and there would be plenty of time to discuss the issue of Europe, and the UK's "great future" outside it, over the next four months. Mr Johnson, who is also Conservative MP for Uxbridge and South Ruislip, has said the referendum was a "once-in-a-lifetime chance" for voters. In a 2,000-word column for the Daily Telegraph, Mr Johnson said staying inside the union would lead to "an erosion of democracy". "There is only one way to get the change we need - and that is to vote to go; because all EU history shows that they only really listen to a population when it says no," he wrote. He added: "This is a moment to be brave, to reach out - not to hug the skirts of Nurse in Brussels, and refer all decisions to someone else. "This is the only opportunity we will ever have to show that we care about self-rule. Several other senior Tories - including Justice Secretary Michael Gove - have already said they will join the Out campaign. It is less than 48 hours since the referendum date was announced, but already the campaigning is in full swing. The leave campaign has been given a major boost by Boris Johnson, who says the only way to change the EU is to vote to go. That has been seen by some as a nod to the possibility of a second referendum if a leave vote prompted the EU to offer a new deal - something No 10 has firmly dismissed. Mr Johnson denies his stance is motivated by party leadership ambition, saying Mr Cameron should keep his job regardless of the referendum result; unlike the former Tory cabinet minister Owen Paterson who has refused to say the same. The prime minister, who argues EU membership offers more power to the UK, will take his case to the Commons this afternoon. There the stance of backbenchers will be closely watched in what is swiftly becoming an intense campaign. Mr Johnson said one of his reasons for supporting the Out campaign was his concern about the erosion of British sovereignty. 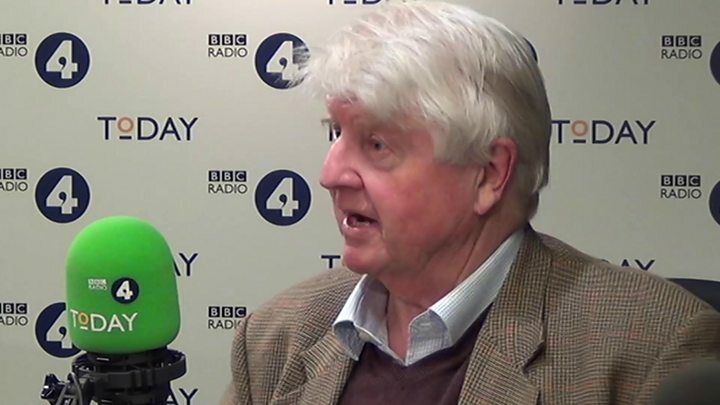 However, his father, Stanley Johnson, told BBC Radio 5 live he disagreed with his son's argument. He denied Mr Johnson's decision had been a "career move", saying he had "completely thrown away" any chance of a post inside Mr Cameron's cabinet by aligning himself against the prime minister. Speaking before Mr Johnson's announcement, Mr Cameron said leaving the EU would give only an "illusion of sovereignty". "If Britain were to leave the EU, that might give you a feeling of sovereignty, but you have got to ask yourself 'is it real?" he told the Andrew Marr Show. Media captionDavid Cameron: "You have an illusion of sovereignty but you don't have power"
The BBC's Laura Kuenssberg said the last 72 hours was the equivalent of a "cork coming out of a bottle" for the Conservatives, with ministers speaking openly about their views for the first time in years and big arguments being made. The Leave campaign has claimed that more than 100 Conservative MP could end up joining its side. The prime minister announced the date of the in/out referendum outside Number 10 on Saturday, having returned from agreeing a deal in Brussels that he argued gave the UK a "special status" within the EU. The agreement - which will take effect immediately if the UK votes to remain in the EU - includes changes to migrant welfare payments, safeguards for Britain's financial services and making it easier to block unwanted EU regulations. The Financial Times reports that bosses of about half of Britain's 100 biggest companies are preparing to back Mr Cameron's campaign to keep the country in the union.